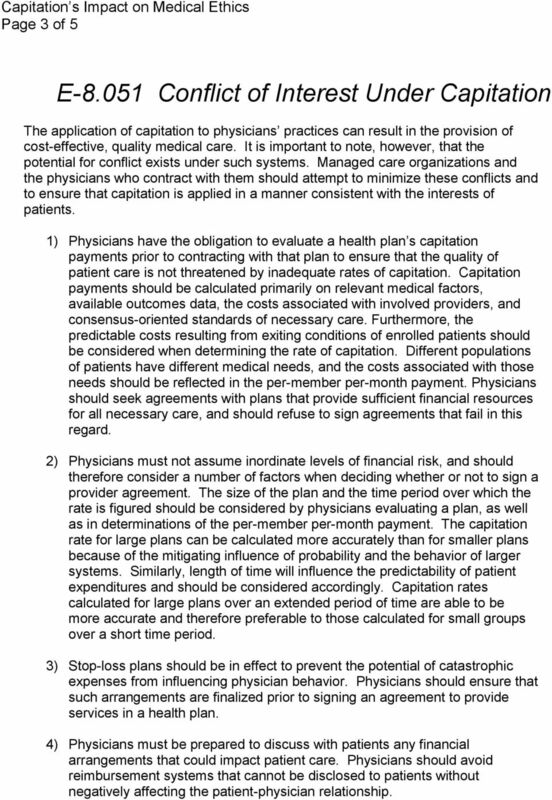 Download "Position Statement on Capitation s Impact on Medical Ethics (Approved by the Board of Directors March 10, 2000)"
3 Page 3 of 5 E Conflict of Interest Under Capitation The application of capitation to physicians practices can result in the provision of cost-effective, quality medical care. It is important to note, however, that the potential for conflict exists under such systems. Managed care organizations and the physicians who contract with them should attempt to minimize these conflicts and to ensure that capitation is applied in a manner consistent with the interests of patients. 1) Physicians have the obligation to evaluate a health plan s capitation payments prior to contracting with that plan to ensure that the quality of patient care is not threatened by inadequate rates of capitation. 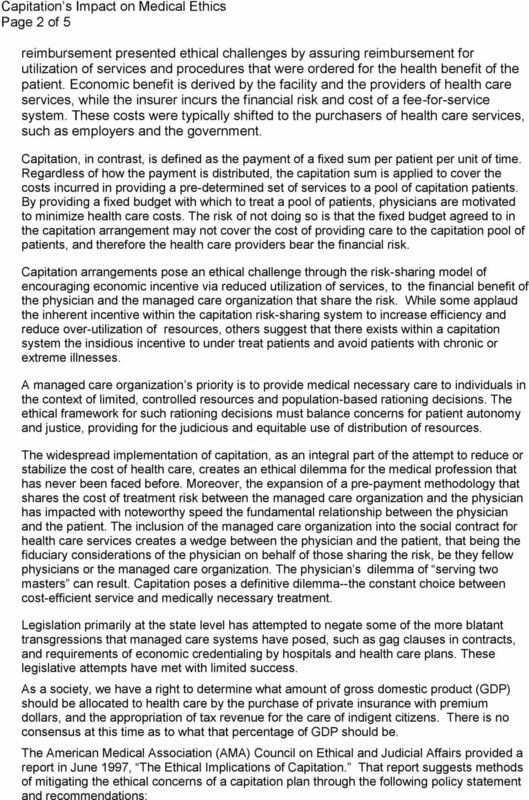 Capitation payments should be calculated primarily on relevant medical factors, available outcomes data, the costs associated with involved providers, and consensus-oriented standards of necessary care. Furthermore, the predictable costs resulting from exiting conditions of enrolled patients should be considered when determining the rate of capitation. Different populations of patients have different medical needs, and the costs associated with those needs should be reflected in the per-member per-month payment. Physicians should seek agreements with plans that provide sufficient financial resources for all necessary care, and should refuse to sign agreements that fail in this regard. 2) Physicians must not assume inordinate levels of financial risk, and should therefore consider a number of factors when deciding whether or not to sign a provider agreement. The size of the plan and the time period over which the rate is figured should be considered by physicians evaluating a plan, as well as in determinations of the per-member per-month payment. The capitation rate for large plans can be calculated more accurately than for smaller plans because of the mitigating influence of probability and the behavior of larger systems. Similarly, length of time will influence the predictability of patient expenditures and should be considered accordingly. Capitation rates calculated for large plans over an extended period of time are able to be more accurate and therefore preferable to those calculated for small groups over a short time period. 3) Stop-loss plans should be in effect to prevent the potential of catastrophic expenses from influencing physician behavior. Physicians should ensure that such arrangements are finalized prior to signing an agreement to provide services in a health plan. 4) Physicians must be prepared to discuss with patients any financial arrangements that could impact patient care. Physicians should avoid reimbursement systems that cannot be disclosed to patients without negatively affecting the patient-physician relationship. 4 Page 4 of 5 Conclusion The Academy recognizes the need to control national health care costs, while maintaining quality care. However, it is the view of the Academy that the four basic tenets of ethical medical practice are in serious jeopardy under capitation. The ability of physicians to deliver optimal care to their patients is constantly threatened. The ability of legislation, such as through a patient bill of rights, may offer some protection. However, the best safeguard for patients and physicians will be the need for total transparency; that is, the patient must be fully informed as to the terms of the contract which governs the physician s ability to treat the patient, provide services, and to some extent make clinical decisions. 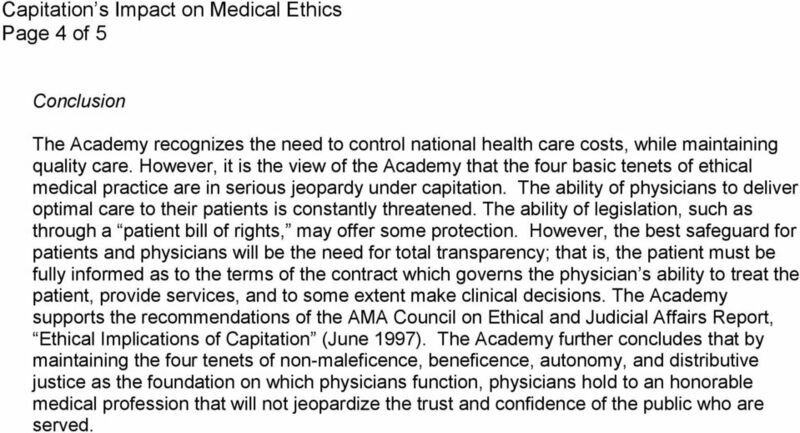 The Academy supports the recommendations of the AMA Council on Ethical and Judicial Affairs Report, Ethical Implications of Capitation (June 1997). 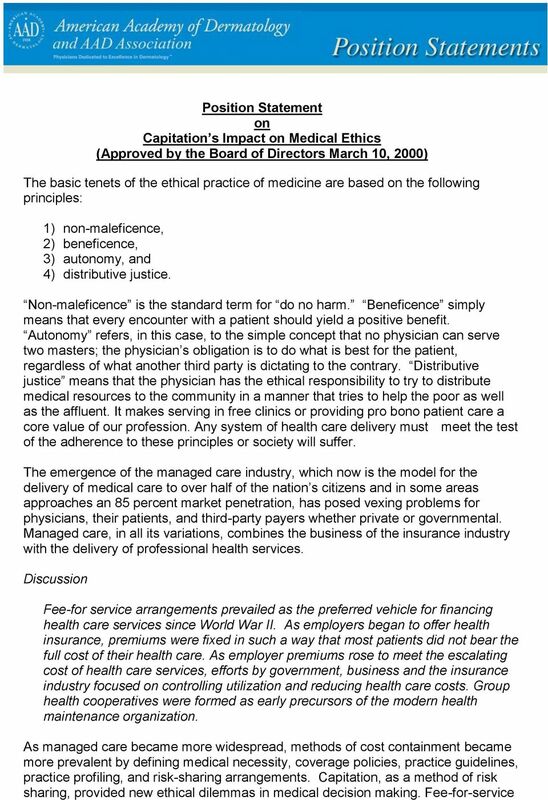 The Academy further concludes that by maintaining the four tenets of non-maleficence, beneficence, autonomy, and distributive justice as the foundation on which physicians function, physicians hold to an honorable medical profession that will not jeopardize the trust and confidence of the public who are served. 5 Page 5 of 5 References American Medical Association Council on Ethical and Judicial Affairs. Ethical issues in health care system reform: the provision of adequate health care. 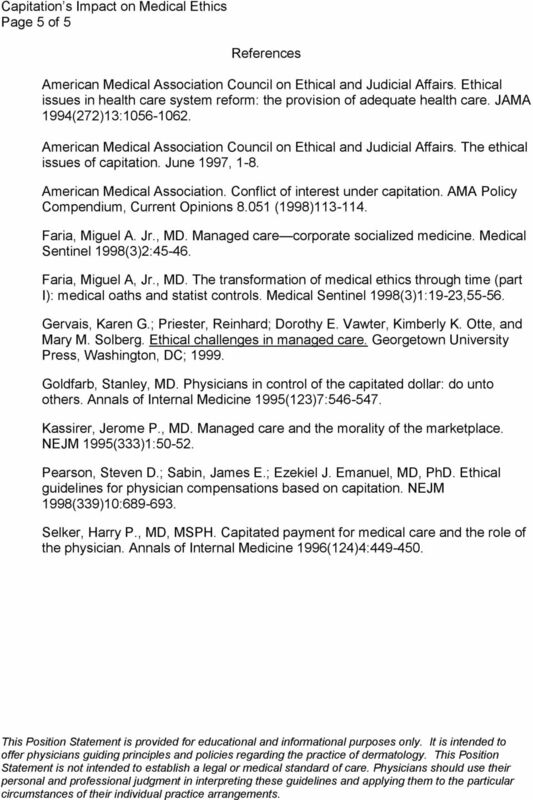 JAMA 1994(272)13: American Medical Association Council on Ethical and Judicial Affairs. The ethical issues of capitation. June 1997, 1-8. American Medical Association. Conflict of interest under capitation. AMA Policy Compendium, Current Opinions (1998) Faria, Miguel A. Jr., MD. Managed care corporate socialized medicine. Medical Sentinel 1998(3)2: Faria, Miguel A, Jr., MD. The transformation of medical ethics through time (part I): medical oaths and statist controls. Medical Sentinel 1998(3)1:19-23, Gervais, Karen G.; Priester, Reinhard; Dorothy E. Vawter, Kimberly K. Otte, and Mary M. Solberg. Ethical challenges in managed care. Georgetown University Press, Washington, DC; Goldfarb, Stanley, MD. Physicians in control of the capitated dollar: do unto others. Annals of Internal Medicine 1995(123)7: Kassirer, Jerome P., MD. Managed care and the morality of the marketplace. NEJM 1995(333)1: Pearson, Steven D.; Sabin, James E.; Ezekiel J. Emanuel, MD, PhD. Ethical guidelines for physician compensations based on capitation. NEJM 1998(339)10: Selker, Harry P., MD, MSPH. Capitated payment for medical care and the role of the physician. Annals of Internal Medicine 1996(124)4: This Position Statement is provided for educational and informational purposes only. It is intended to offer physicians guiding principles and policies regarding the practice of dermatology. This Position Statement is not intended to establish a legal or medical standard of care. Physicians should use their personal and professional judgment in interpreting these guidelines and applying them to the particular circumstances of their individual practice arrangements. ONE MICHIGAN: THE PROBLEM OF THE UNINSURED IS EVERYONE S PROBLEM The attached facts and figures describe how uninsurance is everyone s problem since we all feel the impact of uninsurance in numerous ways. c. determine the factors that will facilitate/limit physician utilization of pharmacists for medication management services. HEALTH CARE SYSTEMS ELECTION 2012 ISSUE PAPER NO. 3 SEPTEMBER 2012. Where Are We Now? Assuring Patient Safety: Registered Nurses Responsibility in All Roles and Settings to Guard Against Working When Fatigued. Statement of Grady G. Thomas, Jr. President, The Interstate Group, Division of Morgan Keegan & Company, Inc.
HEALTH CARE Medicaid Expansion / Health Insurance Exchange This act expands Medicaid under the Affordable Care Act through the private option of policies offered on the state Health Insurance Exchange. MEDICAL CENTERS: ACCOUNTING FOR CAPITATED CONTRACTS H ACCOUNTING MANUAL Page 1 MEDICAL CENTERS: ACCOUNTING FOR CAPITATED CONTRACTS. 1. What's wrong with my current state law that it needs to be changed? Virtual Mentor American Medical Association Journal of Ethics November 2006, Volume 8, Number 11: 771-775.